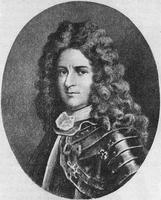 MARIN DE LA MALGUE (La Margue, La Marque, La Marche), CHARLES-PAUL, officer in the colonial regular troops; b. 1633 in the parish of Notre-Dame de Saint-Sulpice, diocese of Toulon, son of Jacques Marin and Hélène Gorel; buried 14 April 1713 at Montreal. 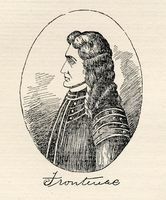 Marin de La Malgue set out from Fort Frontenac in 1682 to go among the Iroquois, in order to make inquiries “about the death of one of the important members of the Seneca tribe, murdered among the Kiskakons at Michilimackinac by an Illinois.” In 1688 he obtained permission to go to France. Having returned to Canada, he married Catherine Niquet on 5 July 1691, at Saint-François-du-Lac. They had six children, four of whom reached adult age. His first wife was buried on 15 March 1703, and on 6 July 1703, at Sorel, he remarried, his second wife being Louise Lamy, daughter of Joseph Lamy and Marie Decheuraineville, who bore him three sons and three daughters. In a letter of 7 Aug. 1693, Governor Louis de Buade* de Frontenac and Intendant Bochart de Champigny alluded to Marin as “commander of the Indiscret,” who with Pierre Le Moyne d’Iberville was to attack Fort Nelson on behalf of the Compagnie du Nord. According to the signatories, the expedition was countermanded because of the inadequate tonnage and poor condition of the ships. Marin is normally referred to as a knight of the order of Saint-Louis, but Ægidius Fauteux corrects this error and mentions among the members of the order only his son Paul* and his grandson Joseph*. He adds that Marin had not risen above the rank of ensign by the time of his death. The historian also notes that the biography of this personage was likely altered by his immediate heirs. Another son Claude* was a trader. In his second marriage contract, drawn up by the notary Adhémar, Marin is called esquire and officer in the colonial regular troops. AJM, Greffe d’Antoine Adhémar, 6 juillet 1703. AN, Col., C11A, 6, f.24. “Correspondance de Frontenac (1689–1699),” APQ Rapport, 1927–28, 147ff. Royal Fort Frontenac (Preston and Lamontagne), 43, 141, 145, 337, 342. Fauteux, Les chevaliers de Saint-Louis, 56–67. Régis Roy, “Les capitaines de Marin, sieurs de la Malgue,” RSCT, 2d ser., X (1904), sect.i, 25–34. Hervé Biron, “MARIN DE LA MALGUE, CHARLES-PAUL,” in Dictionary of Canadian Biography, vol. 2, University of Toronto/Université Laval, 2003–, accessed April 20, 2019, http://www.biographi.ca/en/bio/marin_de_la_malgue_charles_paul_2E.html.